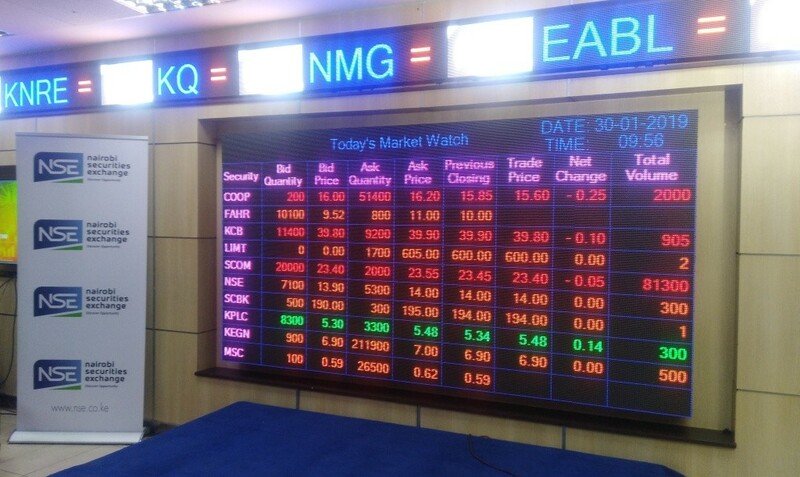 The Nairobi Securities Exchange (NSE) bourse has opened the week on a high with a total of 27.5 million shares valued at Ksh966 million (US$9.6 million), as investors returned to the market after the weekend break. This is however slightly lower compared to the 37.6 million shares valued at Ksh1.4 billion (US$13.9 million) posted on Friday. All market indicators recorded positive gains where the NSE 20 share Index was up 7.76 points to stand at 2903.80. All Share Index (NASI) gained 2.08 points to settle at 160.15 while the NSE 25 Share index added 31.86 points to settle at 3971.97. The banking sector had shares worth Ksh547 million transacted which accounted for 56.61 per cent of the day’s traded value. KCB Group actively moved 6.5 million shares valued at Ksh294.5 million at between Ksh44.00 and Ksh45.00. Equity Group Holdings moved 4.6 million shares valued at Ksh198 million at a fairly stable price of Ksh43.00. Diamond Trust Bank moved 272,000 shares worth Ksh37.6 million and closed at Ksh138.00. Safaricom was however the day’s main feature with 12.8 million shares valued at Ksh366 million changing hands at between Ksh27.50 and Ksh28.75, accounting for 37.82 per cent of the day’s traded value. The manufacturing and allied sector had shares worth Ksh33.6 million traded and accounted for 3.47 per cent of the day’s turnover. 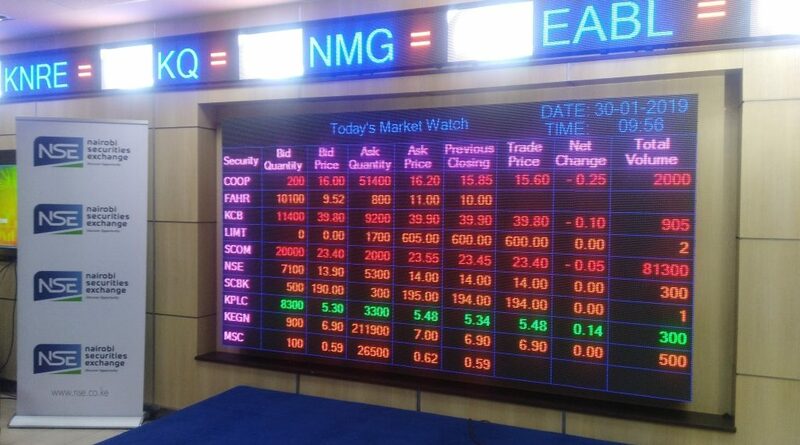 East Africa Breweries Limited (EABL) closed the day 2.37 per cent higher to Ksh204.75 moving 156,000 shares valued at Ksh31.9 million. The commercial and services sector had shares worth Ksh14.7 million traded and accounted for 1.52 per cent of the day’s turnover. Nation Media Group exchanged 132,000 shares valued at Ksh7.8 million at between Ksh59.00 and Ksh67.00. Kenya Airways down 8.73 per cent to Ksh5.02 moved 1.3 million shares worth Ksh6.7 million. The energy and petroleum sector had shares worth Ksh2.1 million traded and accounted for 0.23 per cent of the day’s turnover. Kenya Power and Lighting unchanged at Ksh4.22 moved 386,000 shares valued at Ksh1.6 million. The Bond Market had bonds worth Ksh2.68 billion (US$26.6 million) transacted.